The common redshank or simply redshank (Tringa totanus) is a Eurasian wader in the large family Scolopacidae. The genus name Tringa is the New Latin name given to the green sandpiper by Aldrovandus in 1599 based on Ancient Greek trungas, a thrush-sized, white-rumped, tail-bobbing wading bird mentioned by Aristotle. The specific totanus is from Tótano', 'the Italian name for this bird. ↑ BirdLife International (2013). "Tringa totanus". IUCN Red List of Threatened Species. IUCN. 2013: e.T22693211A50404828. doi:10.2305/IUCN.UK.2013-2.RLTS.T22693211A50404828.en. Retrieved 24 November 2016. ↑ Jobling, James A (2010). The Helm Dictionary of Scientific Bird Names. London: Christopher Helm. pp. 388, 390. ISBN 978-1-4081-2501-4. ↑ Pereira, Sérgio Luiz; Baker, Alan J. (2005). "Multiple Gene Evidence for Parallel Evolution and Retention of Ancestral Morphological States in the Shanks (Charadriiformes: Scolopacidae)". The Condor. 107 (3): 514–526. doi:10.1650/0010-5422(2005)107[0514:MGEFPE]2.0.CO;2. ↑ Schiøler, E.L. (1919). "Om den Islandske Redben (Totunus calidris robustus)". Dansk Ornitologisk Forenings (in Danish). XIII: 207–211. ↑ Buturlin, S.A. (1934). Полный определитель птиц СССР [Polnyi Opredelitel Ptitsy SSSR] [Complete keys to the birds of the USSR] (in Russian). I: 88. ↑ Oberholser, H.C. (1900). "Birds from Central Asia". Proceedings of the U.S. National Museum. XXII: 207–208. ↑ Hale, W.G. (1971). 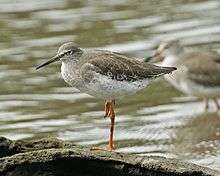 "A revision of the taxonomy of the Redshank Tringa totanus". Zoological Journal of the Linnean Society. 50 (3): 199–268. doi:10.1111/j.1096-3642.1971.tb00761.x. ↑ Wiles, Gary J.; Johnson, Nathan C.; de Cruz, Justine B.; Dutson, Guy; Camacho, Vicente A.; Kepler, Angela Kay; Vice, Daniel S.; Garrett, Kimball L.; Kessler, Curt C.; Pratt, H. Douglas (2004). "New and Noteworthy Bird Records for Micronesia, 1986–2003". Micronesica. 37 (1): 69–96. Archived from the original on 5 May 2009. 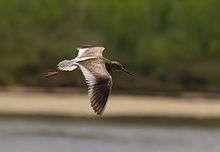 ↑ "Species factsheet: Tringa totanus". www.birdlife.org. BirdLife International. 2008. Chisholm, Hugh, ed. (1911). "Redshank". Encyclopædia Britannica (11th ed.). Cambridge University Press.